SK Telecom in Korea has announced the world’s first LTE Advanced network has been switched on in Seoul, which is capable of speeds up to 150Mbps, and users could download an 800MB file in an astonishing 43 seconds. As 4G LTE only went live there in mid 2011, this is a huge leap forward in a very short amount of time. But what’s the use in having an LTE Advanced mobile network, without a phone that supports the higher data speeds? None, hence why Samsung has announced a new version of the Galaxy S4 to accompany SK Telecom’s new super fast LTE-A service. While the phone may look like the Galaxy S4 we all know and love, there is one key difference between it and the one you can buy today (aside from the LTE-A connectivity, of course), as it’s powered by Qualcomm’s Snapdragon 800 processor, and has a clock speed of 2.3GHz. It’s not the first phone to be announced using this chip, as Sony beat it by a day with the Xperia Z Ultra, but it is the first to fully exploit the chip’s maximum possible speed. The LTE-A Galaxy S4 will be sold in Arctic Blue and Aurora Red color schemes, and still packs a 5-inch 1080p screen, a 13-megapixel camera, 2GB of RAM, Android 4.2 with TouchWiz, and 32GB of internal storage memory. Like other smartphones released in Asia, it also has a T-DMB tuner, and soon SK Telecom will start streaming 1080p video for its LTE-A customers. As Korea is the first country to switch on an LTE Advanced connection, Samsung is unlikely to release its latest S4 variant anywhere else just yet, but we wonder if a model with the Snapdragon 800 chip may find its way into international stores in the future. 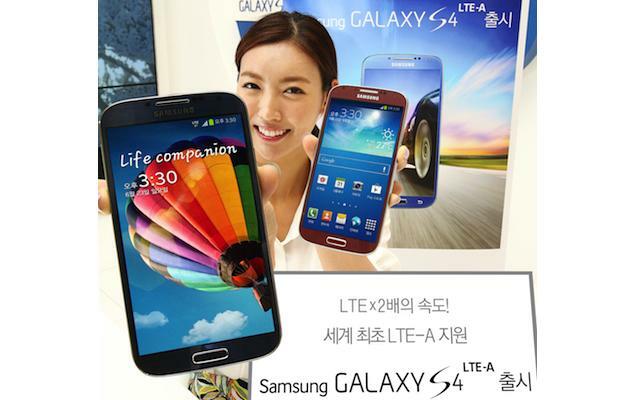 In Korea, the phone and the LTE-A service appear to be available from today, and the Galaxy S4 is the first of seven LTE-A smartphones SK Telecom has planned for the second half of the year.